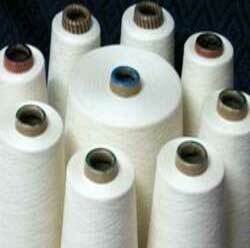 Cotton Blended Yarns offered by us are widely acclaimed for their quality. The Cotton Blended Yarns are made from the finest cotton fibers along with other fibers imported from reputed vendors. The Cotton Blended Yarns are spun and conditioned to ensure that they can withstand the stress in their application. Thus, the Cotton Blended Yarns are apt for making Knitted Fabrics and Woven Fabrics. Why Our Cotton Blended Yarns?